We once built cities around harbors or railroad terminals, which led to the familiar shapes of Amsterdam, Venice, New York and Chicago. But the cities built to take advantage of a hyper-competitive global economy are taking shape around something else instead: the airport. These cities have a name – the aerotropolis. They’re rising around China, India, and the Middle East as each region prepares to take its place on the world stage. They are to our era of instant gratification – the Instant Age – what terminal cities like downtown Chicago and Manhattan were to America’s Gilded Age in the latter half the 19th Century. Aerotropolis: The Way We’ll Live Next explores how air travel and transportation are largely responsible for the shape and scope – and winners and losers – of globalization. It also examines how cities such as Hong Kong, Dallas, Detroit and Dubai are changing (or being built anew) to reflect the interests of corporations that effectively scattered pieces of themselves across the world, relying on the Internet and Airbus planes to tie themselves together. But who are these places for? The companies that profit from marginally leaner operations? The leaders, each one a little more ruthless than the last, jockeying to land them? Or the planners, architects, and sages given carte blanche to raise islands from oceans and plant tarmac in desert? On sale now, Aerotropolis tells the story of how the Jet Age and the Net Age have given way to the Instant Age, and wonders what cities will be its offspring. “Thanks to the manifold effects of modern aviation, earth and sky are merging in our world faster and more thoroughly than most people know. But you won’t be most people after reading Aerotropolis. Throw out your old atlas. The new version is here.” — Walter Kirn, author of Up in the Air. “Very few people realize how profoundly air transport is changing our cities, our economies, our social systems, and our systems of governance. If you want to be way ahead of the curve in understanding one of the most important drivers of change for the 21st century, read this book.” - Paul Romer, Senior Fellow Stanford Insitute for Economic Policy Research; founder of Charter Cities. “Aerotropolis redraws the world map, using air routes to trace the new connections and competition between mega-regions that will shape the geography of the Great Reset. This lively, thought-provoking book is must reading for anyone interested in how and where we will live and work in a truly global era.” - Richard Florida, director of the Martin Prosperity Institute, University of Toronto and author of The Great Reset. “A fascinating window into the complex emergent urban future. This book is an extremely sophisticated, often devastatingly witty and ironic, interpretation of what is possible over the next two decades. It is not science fiction. It is science and technology in action. The authors have one foot firmly planted in the possible and foreseeable.” — Saskia Sassen, Professor, Columbia University, author of Territory, Authority, Rights. “A wheels-up, clear-eyed, as-it-happens dispatch of the world being remapped by our just-in-time, frequent-flying, what-time-is-this-place society. An essential guide to the 21st century.” — Tom Vanderbilt, author of Traffic: Why We Drive the Way We Do (and What It Says About Us). “Aerotropolis presents a radical, futuristic vision of a world where we build our cities around airports rather than the reverse. This book ties together urbanism, global economics, international relations, sociology, and insights from adventures in places that aren’t even on the map yet to present a plausible new paradigm for understanding how we relate to the skies. Perhaps the most compelling book on globalization in years.” - Parag Khanna, Senior Fellow, New America Foundation, and author of How to Run the World. 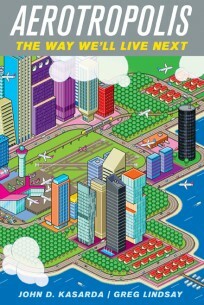 “Aerotropolis comprehensively explains the enormous effects modern aviation has on cities and countries around the world. It is a unique resource.” - Frederick W. Smith, chairman and CEO, FedEx Corporation. “Fascinating… their case studies of failures, successes and known unknowns are music to a logistician’s ears: Why, for instance, should so much air traffic now pass through the Persian Gulf? Because the emirates are blank slates for the experiment, and, as one Abu Dhabi–based technologist says, “because we can fly nineteen hours nonstop now, we’re able to reach any city in the world from here.” The brave new world is on the way, and it’s coming in by air.” - Kirkus Reviews. “Highly recommended.” - Library Journal. 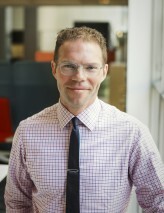 Greg Lindsay is available to speak about the aerotropolis and other instant cities. Email him directly to schedule events. A list of upcoming and past events is available here.